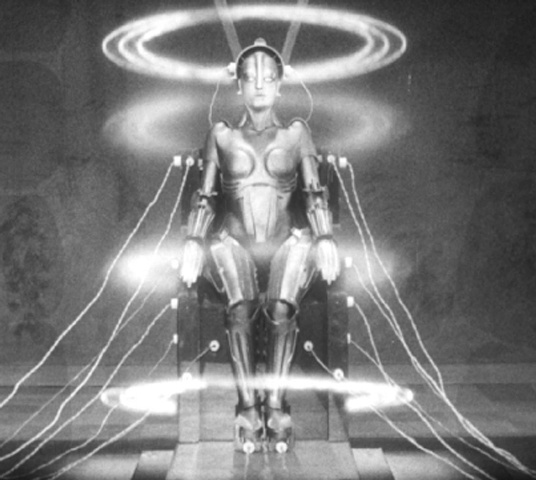 Fritz Lang’s Metropolis is this month’s pick both from my Most Anticipated 1001 Movies List and my blind spot series submission for the Matinee’s recurring feature. I’d been greatly looking forward to it mainly because of the reputation – a ground-breaking silent science fiction work that revolutionised visual effects and many aspects of moviemaking, but also because I’d been saving the episode of the Lambcast that was devoted to it until after I’d seen the film. It’s a show definitely worth listening to, featuring the first Lambcasting experiences of since-regulars Justin Gott, Pat McDonnell and Todd Liebenow, and also features the initial meetings that would go on to form at least two of my favourite podcasts – The Rambling Ramblers and We Sing Poorly. Before I begin discussing my reaction to the film, I feel I should clarify exactly what I watched. 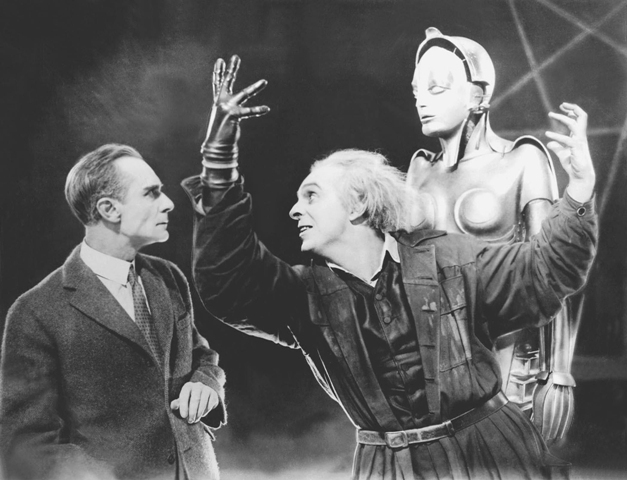 You see, Metropolis has a storied history of releases and cuts, and there are several different versions in existence. The original 1927 2 1/2 hour theatrical release was lost for many years and only recently re-mastered, and prior to that there have been a 90 minute release with an anachronistic soundtrack featuring the likes of Adam Ant and Freddie Mercury. I watched neither of these versions, instead settling for a 2-hour release, mainly because that’s the one I’ve had on DVD for almost a year now without having seen it, and also because it wasn’t until after I’d seen the film that I discovered that multiple releases were available. My decision on which version to watch certainly impacted my overall impression of the film. You see, the reason there are different cuts is because many scenes were at various points in history lost to the world, and as such they’ve been replaced with title cards explaining what is happening during those scenes. This means that, from a visual perspective, I missed out on a lot of the key moments that would have been a wonder to behold being acted out. Instead, I missed out on fights, escapes, gambling, debauchery and capture, as well as most of someone who looked to be one of the best characters in the film, known only as The Thin Man. This grew tiresome and disappointing through the film, but it’s not really something I can hold against it too much – I don’t think it’s Fritz Lang’s fault that some scenes got lost. The most impressive aspect of this film is the scale. 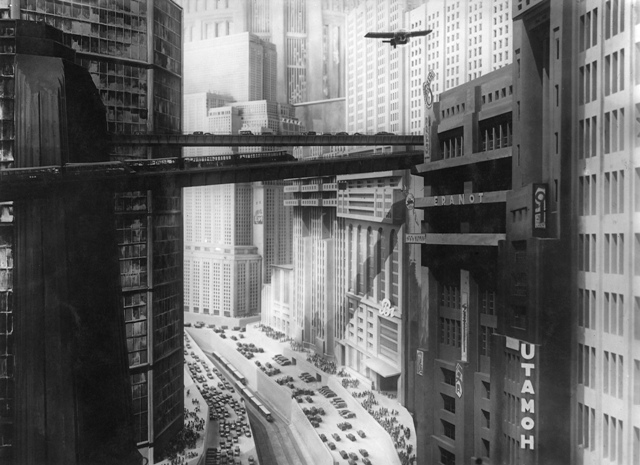 I’m still relatively new to silent films – I’ve seen less than twenty – but I’m pretty sure Metropolis was ground-breaking at the time, and is still very impressive today. There are scenes with literally hundreds of people on what appear to be gigantic sets, at least one of which was flooded. On top of this there’s spectacular special effects – the robot transformation scene is magnificent – iconic imagery – workers at a machine become human sacrifices to some great Sphinx-like temple’s mouth – and film manipulation techniques I am astounded existed back then. All in all I was pretty floored by this film, and that is a great and all-too-rare feeling to have these days. Not only are the effects great, but so is the acting. Amongst the many male performances few stand out – Rudolf Klein-Rogge as mad scientist Rotwang springs to mind, mainly because of his more exaggerated character, as does David Strathairn’s body double Alfred Abel as Joh. The real stand out, in astonishingly her first acting role aged just nineteen, is Brigitte Helm. Predominantly she plays Maria, the woman Freder falls in love with and the inspiration behind the workers’ revolution, but towards the second act she undergoes some drastic changes to her performance. Some spoilers apply from now on, but I had an inkling towards these things before watching the film anyway. When Rotwang’s Machine-Man is transformed into Maria’s likeness, Helm’s performance of the robot from then on is of an Elsa Lanchester in Bride of Frankenstein level. She has a jerky, robotic, bird-like physicality that works terrifically with the character, and I’m shocked that I’ve never come across her name before. I mentioned earlier the iconic imagery of the film. and that really is the major selling point here. The workers dance in unison at their machines; one guy spends a solid 10-hour shift at a giant clock face of light bulbs, forever rotating the hands to point at the flashing bulbs; when an explosion kills some faceless employees, their colleagues diligently carry them away and get back to work, as if this happens every day – which it may well do. There are several longing, lingering shots of the above-ground cityscapes too, and rightfully so. These feature hundreds of cars crossing bridges, planes flying overhead, flickering lights and stunning skyscrapers. My notes have a big “HOW?” circled a couple of times, because frankly I’m amazed at the prowess of movie-making available almost 90 years ago. There’s even a subtle scene with a videophone that is an entirely unnecessary special effect, but is very much appreciated nonetheless. Granted, some of the other technological leaps are a little far-fetched – the Maria transformation, for example – but this is science fiction, dammit, so who cares? At heart this is a class struggle. Joh initially shows little remorse at firing his assistant and condemning him to a life amongst the workers – who, it must be pointed out, never get to even see the Sun – and he has no qualms with his belief that the workers are down “Where they belong.” There are strong parallels to ancient Egypt – the machines are run in a similar fashion to how the Pyramids were built, but there’s also a great deal of very unsubtle religious imagery, more than I liked to be honest, and it didn’t always make sense with the rest of the film, as though it was uncomfortably shoe-horned in. 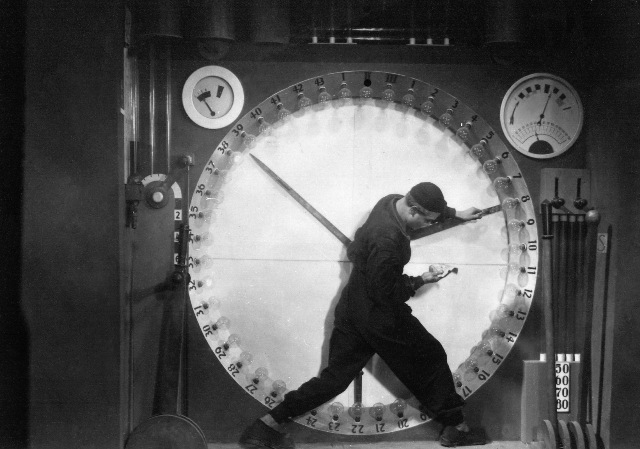 The pace is a lot faster than I’m used to – the first half of the film, which takes in character introductions, Freder’s discovery of the workers’ living conditions and his subsequent integration amongst them, Rotwang displaying his Machine-Man to Joh and several other scenes as well all takes place within the film in the space of half a day. This is fine, it was just unusual when compared to more modern films of this nature. Some elements of the third act were a tad contrived – I didn’t really buy that quite so many people would forget about the existence of their hundreds of children – but as a study in mob mentality it helped to serve a point. Speaking of points, the overall message of the heart being the mediator between the head and the hands was hammered home far more powerfully than was required, especially when it’s a message that doesn’t make a great deal of sense either figuratively or literally. So overall, I did love this film, and I’ll definitely seek out the extended, fleshed out version that includes some of the scenes I missed out on here. As I’m writing this as part of the Matinee’s blind spot series I’m going to finish up by stealing something from Ryan’s podcast, the Matineecast. At the end of each film discussion Ryan and his guest pick a takeaway; an element of the film that they want to keep. 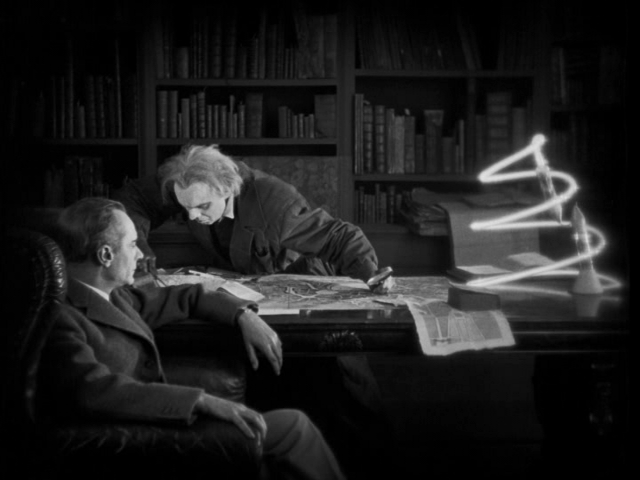 For me, with Metropolis, that would have to be a very literal “thing” in terms of Joh’s desk lamp. It’s a small element of production design it’d be easy to overlook, but I was captivated by that spiralling, bizarre, ridiculously inefficient light. I want one. Now. This entry was posted in 09/10, 1001, 5-Star 500, Blind Spot, Choose Film, Empire Top 301, Review, The List and tagged Alfred Abel, Brigitte Helm, Erwin Bisanger, Fritz Lang, Fritz Rasp, Gustav Frohlich, Heinrich George, Metropolis, Rudolf Klein-Rogge, Theodor Loos by jaycluitt. Bookmark the permalink. The cinematography here is really impressive. 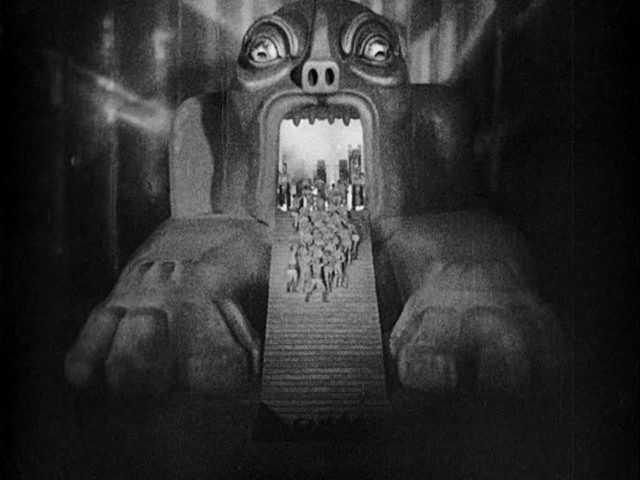 There are countless iconic scenes: the demonic machine that eats people, the quickening of the android, the futuristic cityscape and all that from 1925! But like you I also found the story to be a mess. Only for me it was quite a problem. I just could not dechifer it. What did it all mean? It seemed like at least three or four themes were thrown together and that Fritz Lang himself got confused in the process. Had it been a revolutionary, religious, modernistic or fascistic theme it would have been far better for me, but all at once? Nevermind, that lamp is awesome. If you find one please let me know. I think I was more forgiving for the story’s confusion because of the amazing visuals and groundbreaking techniques used. Perhaps if I watched it a few more times and became more familiar with the cinematography I’d be more critical of the story. If I can’t find the lamp, I’m quite tempted to make one. I work for an electonics company and I reckon we could rustle something up. Let me know if you do. I will place an order. 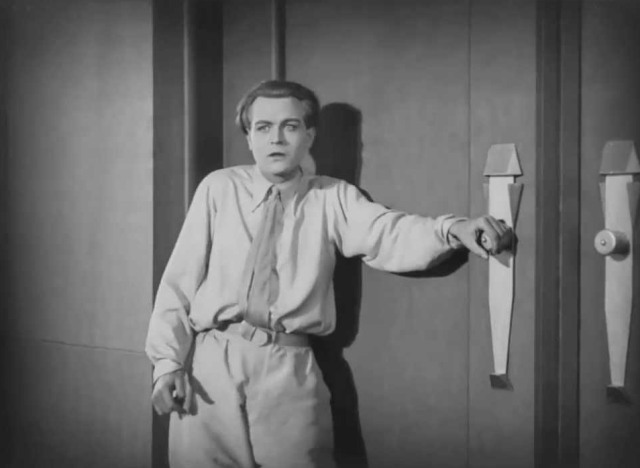 Boy another silent film…I almost want to abstain from commenting! Haha, almost. I’ve not seen this movie but the story sounds like a horror, but at the same time at least there was a lot going on. Visually is also seem very advanced. A great little review (and I agree on the lamp envy!) Cheers. I’d definitely recommend watching the film, especially if you want to give yourself a better understanding of film history like I’m trying to do. And even if you ignore the problems with the story there’s plenty to appreciate here. Thanks for commenting. Its been a while since I’ve seen this so I’m not sure how I feel about the story. I do remember those visuals, though. They’re breathtaking. The best compliment I can think to give it is looks better than top tier sci-fi made 40 years later and possibly even later than that. Gotta love the imagery, and whilst I’m not sure this films looks necessarily much better than later sci-fi films, it definitely inspired pretty much every one that’s been made since.